The administration defends its assassination program takes on administration arguments on this subject, and decries its arrogation of the decision of life-or-death and its vesting in the President. In an addendum, the article then goes on to note some continuity with the Bush administration, namely that this administration too defends its outrageous actions on the grounds that they are necessary to protect the United States. In January 2008 this blogger observed that "... President Bush seems willing to do violence to the second in his efforts to achieve the first.." (the second being the Constitution, and the first being "protecting" the U.S.) . Today, on the eve of the 4th of July, it is most disquieting to see a second President willing to do violence to the Constitution he swore to "preserve, protect, and defend." More appalling, a President who should clearly know better, since as he said "I was a constitutional law professor, which means unlike the current president I actually respect the Constitution." A Wall Street Journal article dated 11/26/2002 "Gonzales Rewrites Laws of War" discusses the role of White House Counsel Alberto Gonzales in the evolving legal strategy of the 'war on terrorism.' It argues he has "developed the underpinning for presidential orders creating military commissions, defining enemy combatants and dictating the status and rights of prisoners held from Afghanistan battles..." The WSJ has this passage: Mr. Gonzales readily admits the White House may lose some ground in court cases. While "being respectful" of constitutional rights, the administration's job ".. at the end of the day is to protect the country. ", Gonzales is quoted as saying. This sentiment is often heard in our political discourse. However Gonzales, as a lawyer in a prominent role in the administration and as one whose name has been mooted as a possible Supreme Court nominee, certainly should know better.... the President of the United States does not take an oath to defend the United States, he takes an oath to defend the constitution of the United States. See the Presidential Oath of Office. AFRTS: "One final question, Mr. President. The families of America's fighting forces, they make huge sacrifices in the name of freedom, just like the service members. You touched on it earlier. You touched on it in your speech today. For months at a time, they give up their service members, they don't know where they are, they don't hear from them; they don't know if they're safe; they don't know if they're dead or alive. What message do you have for these families today?" President Bush: "Well my messages is that what your loved one is doing is the right thing for the country. We are called upon to defend the United States of America. I take that oath, and every soldier takes that oath. And on 9/11 our world changed and we realized the country was vulnerable and we better do something about it. And the best way to secure the homeland is to get the enemy before he gets us. At least that's my attitude. And so I — first of all, the commitment that their loved ones have made, the families of the service members have made, is in line with this business about winning and fighting war. Every person is a volunteer in our military. They've chosen to defend the United States of America. And therefore they need to get the best — if that's their attitude, and they made up their mind that's what they want to do, then my job is to get them the best equipment, the best pay, the best training possible, so if we ever have to send them in, they'll be able to do the job." Three small words.... - "My most solemn duty is to protect this nation and its people against further attacks and emerging threats." - President George Bush at his Inaugural Address given Jan 20th, 2005. As previously observed on the Quotes page (third bullet from the bottom) and on the Oped Updates page (see Quotes page update) the President does not seem to make a distinction between an oath to 'defend the United States' and an oath to "defend the Constitution of the United States" (see the Presidential Oath of Office) This is not a small matter of words, it is a significant difference - and President Bush seems willing to do violence to the second in his efforts to achieve the first.. A lot of ink has been spilled about the "sixteen words" in the 2003 State of the Union (i.e. the yellowcake from Niger error..), but no one seems to worry about these "three words"..
And now, lo and behold, the Republican nominee seems to have the same misunderstanding. In a speech this Wednesday, March 26th, 2008, Senator McCain said "Any president who does not regard this threat as transcending all others does not deserve to sit in the White House, for he or she does not take seriously enough the first and most basic duty a president has — to protect the lives of the American people," see McCain: Collaborate more with allies. On March 28th the McCain Too entry bemoaned the fact that Senator McCain seemed to be one with President Bush, who mistakenly believes that his oath of office (and highest priority) is to preserve, protect and defend the United States, when in actuality it is to “.. preserve, protect and defend the constitution of the United States.” Now the infamous Yoo OLC memos have been released, see Part I & Part II, and it is apparent that the same thought process is involved. In essence it argues that a) since the President’s paramount duty is to protect and defend the US, and b) it’s an armed conflict (war), anything goes in furtherance of these goals. Amazing how dropping just three words so completely changes the focus of what it is all about. Also amazing is these “three missing words” seem to be unrecognized, as opposed to the volumes of ink spilt to decry the President’s extra “sixteen words” in his 2003 State of the Union speech. 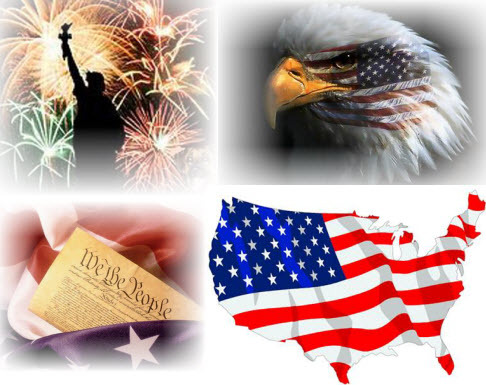 Final note: Yes, this blogger does understand that the Fourth of July is Independence Day, while the United States Constitution was adopted on September 17th, 1787.